I've been a singer-songwriter, author, performer, and businesswoman - running my own record label since 1996. My career has given me the opportunity to tour and perform at festivals, concert venues, and arts centers worldwide for over two decades. My journey has been a fortunate one, but not without obstacles. I was diagnosed with Epilepsy in the early 90's. Music, writing, and the arts, helped me overcome my health challenges and thrive in spite of them. My purpose in life, is to introduce others to the arts in hopes that they, too, can gain a new perspective on life. Simply put: Arte es vida. Art is life. In 1992, I taught guitar lessons to inner city teenagers at a juvenile detention center in New Braunfels, Texas. Teaching a troubled child how to express their emotions through music has also had a lasting impact on me. Over the years, in addition to my tour schedule, I've played music for senior citizens, underprivileged children and adults, those with disabilities, cancer, neurological issues, and other illnesses. These ongoing experiences continue to reconfirm the notion of the power that music and the arts can have on the human soul. 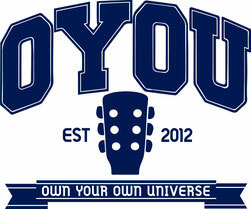 The OYOU stands for "Own Your Own Universe." It's a lyric taken from a song of mine called "Wallet." It's my belief that all things are possible with a sense of purpose, a work ethic, and a mission greater than ourselves. What "Own Your Own Universe" means to me, is that I have the power within me to live the best life I can — regardless of my circumstances, and in doing so, inspire others to do the same. The beauty of the OYOU, is that anyone can take the tools we provide by way of our events and programs, and apply them to their own lives. In doing so, it reaffirms the notion of the power that the arts can have on the human condition and soul. Our programs are accessible to everyone. Because everyone should be able to embrace and enjoy the arts.